The exact replica of what His Royal Highness Prince Henry of Wales "Harry" was given by the Nepalese Army which was crafted by this House also. Own one and be like the Prince of Wales. Here at Khukuri House, we recently crafted a Historic vintage Khukuri ever made. Its size and shape were lost in time and this khukuri was almost in extinction. Khukuri House with a dear friend, we wanted to restore its place back where it belonged to this long forgotten blade. My most skilled craftsmen were put to work and hence was the birth of this Magestic khukuri blade. One uniqueness this blade carries is whooping belly of 3.5 inches making this khukuri very classy and eligant. The balance on this khukuri even for its size is absolutely wonderful. No wonder its popularity in the olden era. We now needed a name for this majestic khukuri. This house along with a few online friends were able to come up with "RAJAGAJ", the name carried by a male bull elephant in Chitwan in eastern Nepal. This khukuri in the other hand was just as strong and robust as this brawny creature and the belly, hence the name. You can call it luck or one can call it good fortune, Prince Harry of Wales was in Kathmandu on his official visit. Khukuri House being the number one khukuri maker in the nation has always entertained the Nepalese Army with their orders of khukuris and for them to come to this house and to look for a khukuri for Prince Harry was in the charts. Then one day these officials did arrive and wanted to give away the best khukuri this house has and it had to be this newly crafted RAJAGAJ. It had the size, it had the shape and was the most authentic of all with historical background, very much like the khukuri Nepalese army have in their collection as prize possession. A look into the blade was all it needed for them to like the blade for Prince Harry. The engraving text honoring Prince Harry was done by KH but the custom scabbard designing of the case were carried out by the Nepalese Army them selves but now this house also managed to make the exact case used on Harry's khukuri. 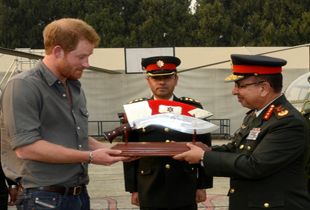 On the day of the presentation, special sources say Prince Harry was overwhelmed by this khukuri and "Wow, what a huge khukuri" was what heard from him. Khukuri House would now like to reproduce this magnificent khukuris for customers and they too can have one like Harry does, feel like a prince and collect a piece of art and history from Nepal.